Every year when my alma mater heads to the Division III National Championship for football I like to post a recipe in honor of our team. For the past two years I've made sweet recipes Purple Raider Pinwheel Cookies and Purple Truffles, so this year I decided to venture a little bit away from that. 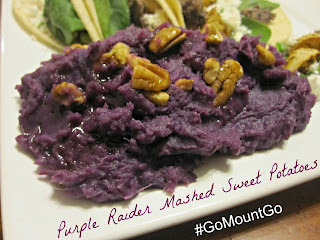 This recipe isn't totally savory by any means, but it's a fun purple side dish for your Purple Raider game day. Go Mount Go! Beat St. Thomas in the Stagg Bowl! The color on these is gorgeous and all natural, I picked up the purple sweet potatoes at my local super market, they probably won't be too difficult to find this time of year. Recipe from Spoon Fork Bacon. In a large pot add the potatoes and enough water to cover them. Place pot over high heat and bring to a boil. Boil potatoes until the potatoes fork tender, 20 to 25 minutes. Drain the potatoes and place them back into the pot. Add cream, butter and a pinch of salt and mash until desired consistency has been reached. Stir in maple syrup, cinnamon and cardamom. Season with salt to taste. Top with maple butter and pecans. I loved how this recipe turned out, the color is just so fun and it complements Mount Union's colors perfectly. The mashed sweet potatoes had a hint of sweetness, but were not cloyingly sweet. There are many different ways to serve this recipe, even on top of mini shepard's pies if you'd like to find different ways to serve up your purple. Thanks for sharing this amazing recipe.! !